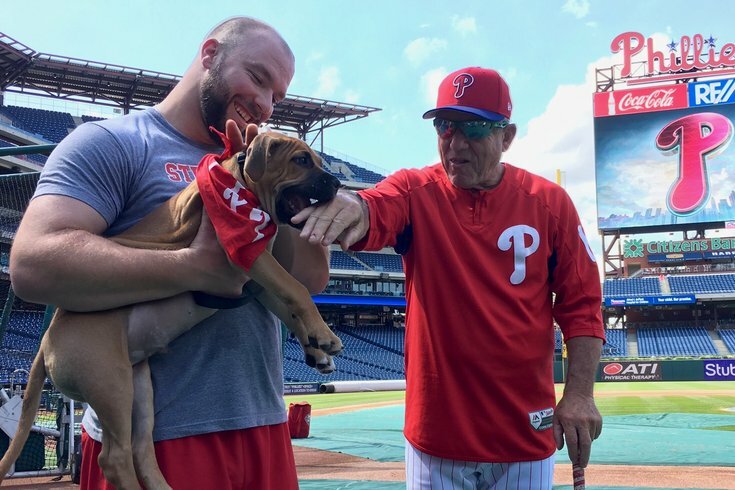 Tiny takes a playful bite of Larry Bowa's hand before batting practice on Monday while under the watchful care of Cameron Rupp. The Phillies catcher will host the first charity event of his professional career, Ruppapalooza, on Thursday night at Morgan's Pier. Eight years ago, Cameron Rupp, then a sophomore and rising catching prospect at the University of Texas, felt the need to add a sidekick. So he hopped on the internet and found the local SPCA in the Austin area. And, within minutes, he found what had been missing from his life. Now Rupp has a proper pack back home in Texas. Frito has since been joined by Beau, a three-year-old chocolate Labrador retriever, and Chief, a 140-pound Italian mastiff who turned a year-old earlier this week. As someone who spends more than eight months of the year on the road – when Phillies spring training begins in Clearwater, Fla., in February until the end of the regular season in early October – it crushes Rupp to be separated from his pups. He has family to take care of them back in Texas, but there’s clearly a void in his Center City home. Rupp found some comfort in filling that void this summer when he began working with the Pennsylvania SPCA, a new partnership that’s culminated with his first ever charity event: Ruppapalooza at the Pier. The event is being held this Thursday (July 27) from 6-9 p.m. at Morgan’s Pier on Columbus Boulevard. For $35 going to a worthy cause, attendees will get to hang out with Rupp, his guest-bartender Phillies teammates, the Phillie Phanatic, Flyers defenseman Shayne Gostisbehere, and, of course, at least a half-dozen dogs available for adoption. 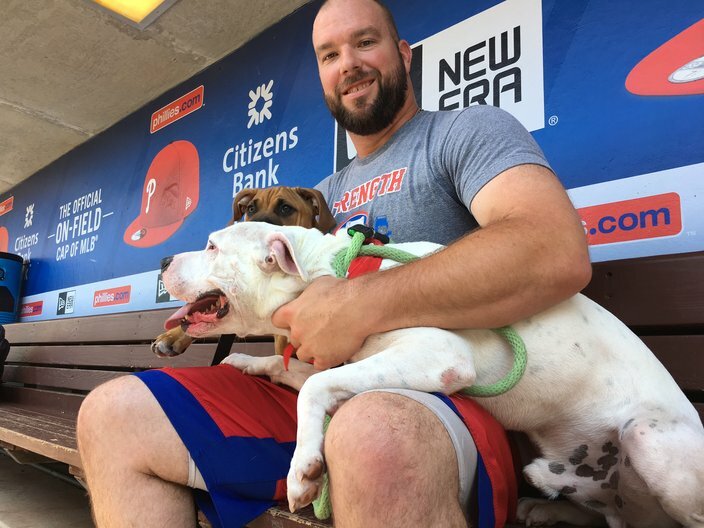 Cameron Rupp with Pennsylvania SPCA adoptable dogs Jerry and Tiny inside the Phillies dugout. Rupp, who has three dogs at his offseason home in Texas, is hosting his first charity event this week, Ruppapalooza, to benefit the SPCA's life-saving mission. At Ruppapalooza, the $35 admission will provide one free drink and “baseball fare” to munch on while listening to music and mingling with Rupp and the pups. There will also be raffles and games, all in the name of benefitting the SPCA’s life-saving mission. For more info on Thursday’s event – to purchase tickets or make a donation – check out the PSPCA’s site with all of Ruppapalooza details.